Sawyer Brockstedt likes to practice golf, and so she’s perfectly fine with the extensive preparations she’s been making for the national Drive Chip & Putt Championships at Augusta National Golf Club April 1, the Sunday before the Masters Tournament. The DCP Championship puts competitors in separate age and gender groups for two attempts in each category, with point values for each attempt. Brockstedt won a local qualifier, a sub-regional, and a regional contest last September to qualify for the nationals. Sawyer Brockstedt is competing at the Drive Chip & Putt Championship at Augusta National Golf Club April 1. 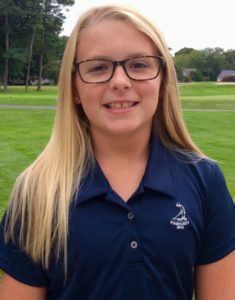 The fifth-grader at Rehoboth Elementary School has taken lessons from Kings Creek County Club’s Chris Krueger and teaching pro Michael Hunt of Doral in Florida and Bayonne Golf Club, NJ. They focus on the three skills she will have to demonstrate at the televised contest. Brockstedt spent a four-hour session with Hunt at Bayonne last fall to assess her fundamentals and determine areas for improvement. “We used a Trackman monitor and he was making sure I had the right angle of attack. He wants to see consistent divots on the other side of the ball, and no chunking,” she said. Brockstedt first started playing golf at 5 years old. “I didn’t play in tournaments. I just hit balls sometimes. Like maybe once a week I played a couple holes with my dad.” Watching the Drive Chip & Putt Championship at age 8 convinced her to take the game more seriously. “I participated in the Drive Chip and Putt that summer at Wilmington Country Club and then I started practicing a lot,” she said. Her nerves are also only 11 years old: “I don’t really feel pressure. I’m kind of relaxed. I wanted to do it very badly and I liked it. I had fun,” Brockstedt said. She said her dad and her “Pop Pop” Pete Brockstedt have had the most influence on her interest in golf. “Pop Pop’s played with me a lot, and plays with me after school. My dad will play with me after work and we’ll go to the range and practice. They make me want to get better ‘cause I want to beat them,” she said – and then she giggled. Brockstedt’s current handicap index is a respectable 8.9. Her drives, which she describes as “pretty straight with a little bit of fade on it” usually carry over 180 yards and run out to 205 to 210. Her iron distances are good, such as 120 yards with her 9-iron, with 10-15 yards of separation between each club. She uses a Scotty Cameron mallet putter, Titleist wedges, and Callaway irons. Her hybrids, fairway woods, and driver are from the TaylorMade Kalea line. “So it’s a mixed bag,” she said.